What Is the Sizeable Pregnancy Weight Gain Made Up Of? Pregnancy weight gain is not only a natural process, but a necessity as well. Your body needs to store more fat and minerals because now you not only have to nourish yourself, but also nourish the development of your child. Pregnancy weight gain is a necessity, but you must make sure that you do not gain extra weight. If you become over weight, you might have complications or difficulties with the child’s delivery. So how will you know that you are starting to gain those unnecessary extra pounds, and if you do gain them how do you lose them? With so much importance associated to the weight that the mother-to-be gains during the pregnancy, you need to make sure that you are eating the healthiest and beneficial diet available to you; but, this is a diet that is not intended for weight loss, it is intended for proper nutrition. A healthy diet will help keep you in proper health, nourish your developing baby, and will also help to gain or lose your weight as your condition may demand it. Generally, during the first 3 months (the first trimester) a pregnant woman should gain around 2 to 4 pounds. From the third month on, the mother needs to gain at least 1 pound every week until the delivery. The weight that a woman needs to gain for her pregnancy has already been discussed, but how much of the pregnancy weight gain is actually the baby’s weight? The proportion of the weight of the baby itself to the entire weight gain hovers around 8 pounds. 2 to 3 pounds of the weight qualify as the placenta’s proportion. 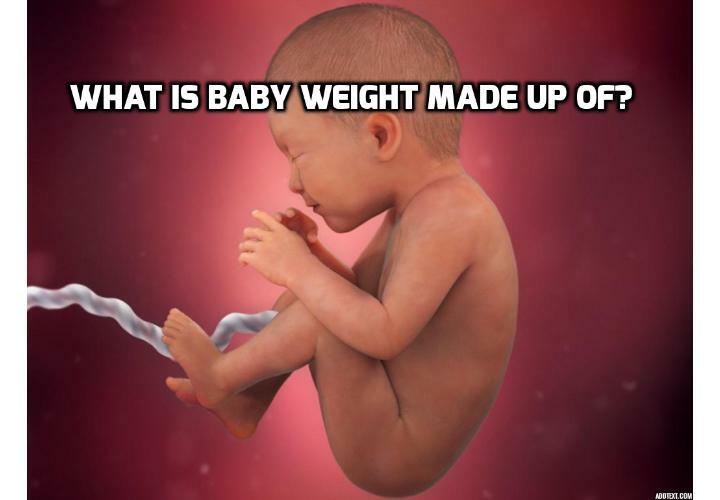 The Amniotic fluid adds around 2 to 3 pounds more to the entire weight. The extra breast tissue that develops (necessary for breast feeding) comprises of yet another 2 to 3 pounds of the total weight. The blood that is stored for the pregnancy amounts to about 4 pounds of the total weight gain. The extra fat that is stored for the delivery of the baby and breast feeding adds around 5 to 9 pounds to the total weight. The above is a general break up of what the mother’s entire weight gain comprises of, but the important thing is the weight of the mother before the pregnancy. If a mother-to-be is underweight then she needs to gain 28 to 40 pounds altogether, and if the mother-to-be is overweight, she only needs to gain around 11 pounds. You can watch this Video HERE and this Video TOO about topics on pregnancy weight gain. Previous PostPrevious Weight Gain During Pregnancy – How Much Is Really Excellent? Next PostNext Does a Woman’s Weight before Pregnancy affect Baby Weight Gain?